Established in 1934, Lindapter International is the pioneer of steelwork clamping systems, including the Girder Clamp and Hollo-Bolt. 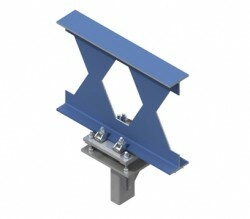 Lindapter’s adjustable steelwork fixings are specified across a diverse range of applications throughout the global airport industry, with applications ranging from the securing of baggage handling systems, the installation of service walkways to structural steel connections for hangars and terminals. Lindapter steelwork fixings allow for quick and easy, no weld connections that can save both time and money without the need for hot work permits; a common cause of construction delays. The extensive range of unique products has been awarded a whole host of independent product approvals, giving the Lindapter brand a reputation synonymous with safety and reliability. Current accreditations awarded by international associations include CE Mark, Lloyds Register, TÜV NORD and Deutsches Institut für Bautechnik. With a global distribution network, complimented by Technical Support including a free design service, Lindapter can provide customers in the airport industry all over the world with market leading solutions to meet their specific needs. Visit www.lindapter.com to get your copy of the new catalogue. Lindapter, inventor of the Girder Clamp and Hollo-Bolt®, have a cost and labour saving solution for a vast range of steelwork connections. 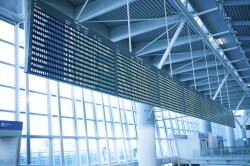 Typical applications in the airport industry include the securing of cladding and façade brackets and frameworks to primary steelwork and the connection of steel sections to the main structure of terminal buildings. The Lindapter Girder Clamp is capable of being used in many loading situations including tensile, friction or a combination of the two on horizontal or vertical sections. Capacities range up to 250kN for a four bolt configuration. The legendary Lindapter Hollo-Bolt®, for hollow sections, tubes and where access is available from one side only, is easy to install with standard tools. The Hollo-bolt is the only cavity fixing to be recognized for primary structural use by the SCI and BCSA in their ‘green book’ connection guide. Lindapter fixings provide a proven method of securing bagging handling frameworks to structural steelwork in airport buildings. A variety of Lindapter steelwork fixings have been used around the world in baggage handling conveyor connections. At Gatwick Airport, London, the type AF was selected due to its extreme strength, capable of up to 250kN per connection, whilst the type LR was chosen by Dublin Airport, T2, because of its ability to fit flange sizes ranging from 3-24mm. The key benefit of Lindapter steelwork fixings used to connect baggage handling conveyors is their adjustability. The easy installation, adjustment and, if required, the removal of the components allows for easy alignment and straightforward installation. Airport terminals are packed with building services virtually all of which can be supported, suspended or connected using Lindapter fixings. Lindapter steelwork and support fixings have been used in airports all over the world in the suspension of HVAC equipment, pipe work, fire protection/sprinkler systems, suspended ceilings and electrical equipment. The high quality connections are extremely adjustable, allowing the fast alignment of various building services for a quick, cost effective installation. With safety paramount in all airport environments, you can be assured by the independent fire protection approvals for Lindapter’s support fixings, including VDS and FM. The Lindapter Hollo-Bolt® has been widely used in the connection of hand-rails and barriers within terminal buildings. The option of a flush-fit head allows for a discrete, aesthetically pleasing yet safe and secure connection. For service walkways, Lindapter offers a range of Lloyd’s Register approved floor fixings, specified on several international airports. 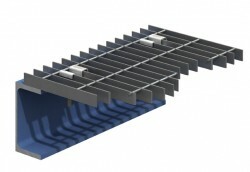 For open bar grating walkways, Lindapter invented the Grate-fast® (type GF): a corrosion resistant fixing to connect the flooring to supporting steelwork without the need to weld or drill. For chequer plate flooring, Lindapter created the Floorfast®: an innovative malleable iron casting that allows flooring to be connected to supporting steelwork without needing to access the underside of the flooring.